Brief Description: Aggressive broadleaf weed with small blue flowers and fan, cone shaped leaves. Ground Ivy is a perennial broadleaf weed related to the mint plant. It has a distinct, pleasant smell. It sets up multiple roots all connected to large vines, making hand removal very difficult. Ground ivy can also grow quickly, so when it takes over a lawn it can cover entire sections in a short period of time and become very difficult to remove by hand. These plants are edible, so if you do have ground ivy and you’re certain it’s not Persian Speedwell (a lookalike that is not edible), you may want to turn it into a salad or a green smoothie while you figure out how to remove it. When you are ready to remove it, it’s best to call experts. Like many broadleaf weeds, ground ivy takes advantage of weaker turf. It enjoys moist, shaded areas and takes advantage of weak grass that is unable to choke it out. Mowing doesn’t get rid of ground ivy because the roots spread across the lawn. In general, once you have ground ivy it is best to get it removed professionally. 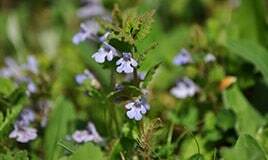 Contact Green Lawn Fertilizing today to find out more about our ground ivy broadleaf weed control services, and to learn more about how we attack ground ivy and other weeds.